So, in addition to setting up a three mile Green Belt round London and Westminster, the Act also prohibited the creation of houses in multiple occupancy. It all has a very 21st Century ring about it! ‘Inmates’ and ‘Under-sitters’, by the way, are 16th Century terms covering lodgers and sub-tenants. At that time the size of towns was somewhat constrained by how far people were prepared to walk to work, but scrolling forward to the 19th and 20th Centuries, the coming of railways and then the car prompted a big expansion of suburbia. For London, the response to this was the Green Belt (London and Home Counties) Act 1938. This empowered Local Authorities to buy land to keep it open as Green Belt. Some of the Green Belt we know today is land acquired under the 1938 Act. An important feature of the Act is the provision that Local Authorities may not sell land acquired under the Act without permission of the Secretary of State. The 1938 Act also made provision for landowners to enter into covenants that their land would be treated as part of the Green Belt in return for a compensatory payment from the Local Authority but little or no use appears to have been made of this provision. After the second world war, there was a recognition of the need for society to control the development of land, resulting in the Town and Country Planning Act 1947. This Act laid the foundation of the modern planning system. However, the 1947 Act did not address the issue of Green Belts directly and left the 1938 Act unaltered. It was, nevertheless, realised that it is not feasible for local authorities to purchase all the land needed to maintain a proper Green Belt and the covenant option was not working. What was needed was a way of controlling development without interfering with the ownership and existing use of land. 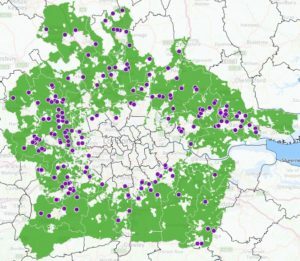 A number of the local planning authorities in and around London started writing into their local plans belts of restricted development to stop the uncontrolled spread of London. The Government approved of the idea and on 3 August 1955, the Ministry of Housing and Local Government (as it then was) issued a circular to all Local Planning Authorities asking them to establish Green Belt in their Development Plans wherever appropriate. In 1988 the Principles of the Green Belt were incorporated in Planning Policy Guidance Note No. 2 (PPG2) issued by the Government. The latest revision of PPG2 was published on 24 January 1995 (with a small amendment in 2001). This has now been superseded by the National Planning Policy Framework and it is a credit to the drafters of the 1955 circular that so much of their work can still be seen in the NPPF. Green Belts have been one of the most enduringly successful and popular elements of the post World War 2 planning reforms. They have helped to maintain a clear distinction between town and country which can be lacking in some other parts of the world.